What is the Summer Palace? 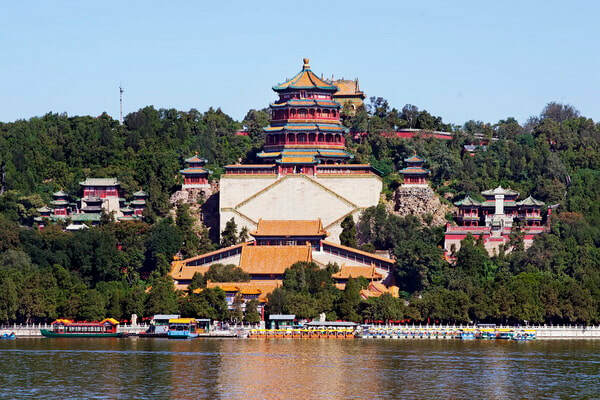 Located in the western suburbs of Beijing, Summer Palace is 15 km from the city of Beijing. It is adjacent to the Old Summer Palace. Known as the “Royal Garden Museum”, the palace is also the most preserved royal palace in Beijing. Built by the design method of gardens in the south of the Yangtze River, it is a large-scale landscape garden. With an area of 290 hectares, Summer Palace is mainly composed of Wanshou Mountain and Kunming Lake. There are more than 3,000 rooms in various style of palace garden. These rooms can be used as administration area, living area and sightseeing area. The administrative area is centered on Renshou Palace. The Empress Dowager Cixi and Emperor Guangxu met foreign guests in this area. Behind Renshou Palace are three large courtyards: Leshou Hall where Cixi lived, Yulan Hall where Guangxu lived and Yiyun Hall where the wives of the emperors lived. Suzhou Street is a trading street built on the banks of the Houhu Lake similar to the buildings in the south of the Yangtze River. Tibetan Buddhist architectures and multicolored glass multi-towers stand in the area of the rear mountains of Wanshou Mountain. Located in the middle of the rear mountains, Sidabuzhou Building is a Han-Tibetan-style architectural complex. Covering an area of 2 hectares, it offers the main buildings - Xiangyan Zongyin Pavilion. The Wisdom Sea Temple is the highest religious building on the top of the Wanshou Mountain. It is a beamless stone temple made entirely of masonry. It consists of a vault structure. The exterior is all decorated with yellow and green glazed tiles. The roof is covered with a small amount of purple and blue glazed tiles. Baoyun Pavilion is one of the most exquisite and bulky copper existing castings in China. Originally built by Qianlong for his mother’s 60th birthday, Paiyun Temple is the most spectacular architectural group in the Summer Palace. The Gallery is located at the southern foot of Wanshou Mountain, facing Kunming Lake. It is 728 meters long. It is the longest veranda in Chinese gardens. There are more than 14,000 drawings painted on the beams, including landscapes, flowers, birds, fish, and characters. Kunming Lake is the largest lake in the royal gardens of the Qing Dynasty (1644 - 1912). Leshou Hall is the main building in the living area in the Summer Palace. Visitors can admire various kinds of other numerous attractions there. The best time to visit Summer Palace is in the morning during its opening hours. Visitors can visit the palace around the year. There are several buses passing by Summer Palace. Therefore, there are several options. Rent a vehicle to the palace. This is the quickest and most direct option. Take Bus 330, 331, 332, 346, 584, 594, 375, 563, 508, 579, 303, 584, 374, 74, 437, and Bus 952 to the palace. From April 1 to October 31: Opening hours: 06:00 - 18:00; the gardens in the area of the palace: 08:30 - 17:00; From November 1 to March 31: 07:00 - 17:00; the gardens in the area of the palace: 09:00 - 16:00. As at 14th September 2018, the entrance tickets to Summer Palace is 30 NCY per person from April 1 to October 31; from November 1 to March 31, the entrance tickets to Summer Palace is 20 NCY per person. From April 1 to October 31, the pass for the entrance to the gate and the entrances to the gardens in the palace is 60 CNY per person; from November 1 to March 31, the pass for the entrance to the gate and the entrances to the gardens in the palace is 50 CNY per person. The palace offers auto-guide rental service and the tour guide interpretation service. It is not suggested to play on the surface of Kunming Lake in winter. Interested in visiting the Summer Palace on a Tour? Wendy Wei Tours offers a variety of different packaged tours as well as custom tours including the Summer Palace, among other attractions and destinations. To find out more, please visit our Tours page or Contact Us directly to find out more.